This is the first time Tales has had two main characters. What did you struggle with when working with that concept? Kiga: The fact that the game had to end with them both as main characters, rather than one as the main character and one as the heroine. Information control was also difficult. Stuff like “we don’t learn that on Milla’s side,” or “we don’t see that scene on Jude’s side so this conversation has to happen as if they didn’t know,” etc. Did you decide to split the story from the beginning? Kiga: Yes. Although at first the idea of changing point of views halfway through was also on the table. But with that one it was harder to imagine how the players would follow the story, and information control would have been more difficult. So we asked to make it so that the players could choose which point of view to follow at the start of the game. What did you especially paid attention to while writing the two sides? Kiga: We focused on the main characters’ respective feelings. For example, on Jude’s side, we don’t know what Milla is thinking when she acts, but the story still has to make sense. We tried to stay as close to the edge of what we could obscure from one side while still making sense. When the party splits and regroups, we want to know what the other characters were doing, don’t we? Kiga: We can omit things like what the other main character was thinking during the split, but we still have to give basic information about what happened, otherwise the plot wouldn’t make sense. That’s why when the characters regrouped we included a small summary of the events. Hasegawa: At first we didn’t want to give that information, and leave it to skits and sub events. However, it would have hurt the game to make the plot hard to understand in the main scenario, so we added in some basic information sharing. What did you handle with the most care when expressing Jude and Milla’s growth? Kiga: Playing Jude’s side might make the players think he’s the leader, but in truth he only becomes a leader at the end of the game, so we had to be careful not to make him pull the party behind him. That’s why we asked his voice actor, Tsubasa Yonaga, to voice lines like “let’s go there” as suggestions rather than decisions. For Milla, we were careful with expressing her feminity. It would have been a failure if the players perceived her as a weak character. We tried to show that being strong and being a woman weren’t mutually exclusive. Hasegawa: Milla and Jude react differently to the same events. So if Jude says “I’m thinking of doing this,” Milla would respond “All right, meanwhile I will be doing that. Good luck.” That’s why they delayed talking about their final conclusion. It’s a bit like waiting for the right moment to confess (laugh). We paid attention to maintaining that situation while letting the story progress. With this, and with the distance between Leia and Alvin, we attempted to portray realistic human relations. The scenario was written by several people. Were there divergences of opinions regarding the characters? Kiga: We debated about the idea to have Milla develop romantic feelings. Some were afraid that it would make her appear weaker. But I think that the feelings she developed at the end are part of her strengh as a woman. I think (female) players wouldn’t like her as much if she was just like a male character. Hasegawa: We didn’t want her to be a character only liked by the male players, so we went to the female staff for advice. And they told us “Please don’t make her a character who threw away her feminity!” In other words, it was not enough to make her cool, she also needed to be a female character that women could relate to. That’s why she sometimes worries about her appearance and so on, for example. Speaking of female characters, was Leia hard to write? Kiga: Leia is straightforward, so it wasn’t hard at all. We wrote her with Saori Hayami’s voice in mind, so the acting fits her lines perfectly. And for example when some lines may have sounded cheesy on paper, we knew that Hayami would make them sound endearing. The staff only sees the written lines, so they were like “Are you sure she won’t sound annoying there?” but I replied “Nah, it’s Hayami, it’ll be all right.” (laugh) The party would be pretty gloomy without Leia. Hasegawa: At first, Rowen was more playful and was the one to loosen the atmosphere, but the episode where he joins is serious for his character arc, and having him be too much of a joker then would have been inappropriate. Kiga: Indeed. Cline dies shortly after we meet him, and he had to overcome many problems. So Rowen was only allowed to mess around once the story had progressed a bit more. Hasegawa: Rowen was hard to write. He’s like Abyss’s Jade, he’s a shrewd man. It’s hard to make characters like that make big mistakes or say immature things. We hesitated a lot over how to portray his sharp ex-strategist side. Hasegawa: Oh, Alvin’s a character who sprung out by opening all of Kiga’s drawers (laugh). When I saw Fujishima’s design, I wondered if he would be popular with the ladies, so I thought of faxing it to women in the staff. Kiga showed himself at his best (laugh). Alvin was completely left to him. Kiga: Alvin is a character targetted at men of the same age. Most of the women who read the scenario said that they didn’t get him, but the men could see some parts of themselves in him. During recording, Tomokazu Sugita, his voice actor, told us he was such a terrible man that he was hard to voice. Their age is close and they are similar in some ways, so he felt Alvin brought some of his weaknesses to the surface, making it hard for him (laugh). Hasegawa: It’s true we didn’t try to make him pleasant for women. Personally I think he’s the most developed character in the game, but he’s a character you either love or hate, so I’m looking forward to the players’ reactions. Do his suspicious moves make him an incentive to start a second playthrough? Kiga: In a way. Alvin is a character who doesn’t say what’s important, but I wrote him while keeping an awareness on what he was thinking. Hasegawa: We wanted to spin a new twist on the traitor character trope. In a way, his concept is that of a character for who we want players to yell “Your place is right there!” at him. Kiga: It’s obvious from the start that he’s going to betray the party (laugh). We wanted the players to expect that moment. What’s important is make them wonder what he’s thinking after that happens. Hasegawa: Yes. It’s one evolution of the traitor character. His “I didn’t know! I swear!” line [TLN: when Exodus kidnaps Teepo in Xian Du] was a good one (laugh). Kiga: Oh that… If for example Hasegawa was mad at me, even if I wasn’t directly responsible I couldn’t say “It’s not me!” like that. But Alvin does it. That shows his immaturity. Rowen’s right when he says he’s still immature. Kiga: He’s the type to get along well with people but not have any real friend. I think that to make a true friend, you have to let them see your weaknesses, and deepen your bond based on that, but Alvin’s always evaded showing his true self. And then Jude matured before him. When you’re a man in your late twenties, seeing a much younger guy become an adult before you makes you anxious and a little annoyed. Then you start thinking about what you should do and you realize that if you don’t make the first step, you can’t form meaningful relationships. That’s how you finally get the mindset to commit yourself to society. Hasegawa: And that’s when you form relationships where you can really talk about your feelings. But when Alvin tries to do that, he always ends up running away. But at the end he’s finally reached a place where he can listen. He’s getting closer. His relationship with Jude should be okay, and Milla doesn’t mind much. The key is Leia. We hesitated a long time about what Leia would think. Kiga: Personally, I don’t think friends are just “people you stay with.” When you make your entrance in society, you do it on your own. True friends are people you can maintain your relationship with even when you’re not always together. That’s why I think the act of making up itself isn’t the most important for Alvin and Leia. What will matter the most is whether they keep in touch after the end. If they do, they’ll be all right. Hasegawa: Well, we could have made sub events and chats where they quarreled or that showed where their relationship went, but we thought it was superfluous. The main characters are Jude and Milla, and their story can be completed without showing every single of their companions’ feelings. Where there other dropped ideas like that? Kiga: At first, we thought of making Gaius and Muzét join. We wanted to make multiple endings. In Route A, you would fight Gaius and Muzét. In Route B, Muzét would join and you would fight Gaius. In Route C, Gaius would join and you would fight Muzét. In the end we couldn’t do that, for reasons. When writing the characters, what details did you pay attention to? Hasegawa: Milla is polite, but since her knowledge of humans interactions comes from books, she doesn’t know that some things are not appropriate in certain contexts. For example she knows that people thank each other when they do things for each other, so she would thank people even when it would be better not to in some situations. Kiga: Alvin doesn’t really assert himself. He says what people want to hear or tries to control the conversation. He’s a spy after all. His opposite would be Ivar. Kiga: We didn’t expect the visuals to be so important. The scene where he bows to Milla was written when we saw the motion. We were surprised at the things he could do. Hasegawa: His lines themselves are not that funny, it’s his actions that make him a comic relief character. What I can say without doubt is that he became so popular with the staff that suggestions fused from everywhere, and that’s how he became how he is. Mr. Shibue, the motion director, is not the last who wanted to play around with him. Are there other characters who changed when you saw them in action? Hasegawa: Agria. Since she was the first boss you fight, her model was done early. When we saw her battle motions, we thought we should make her more explosive. Kiga: We even overdid it. We pushed her to a level where we would probably have received complaints for it, so we toned it down. It may be hard to imagine, but she’s a lot calmer that she could have been. But her lines often coming out of left field is all my doing (laugh). Hasegawa: I was the one in charge of her at the Laforte Research Center. She’s more normal there because we hadn’t seen her model in action yet. Kiga: After that she completely loses it (laugh). Her concept was that of a delinquent girl from the Shōwa period [TLN: 1926-1989]. We told that to her voice actress, Maaya Sakamoto. Hasegawa: Others whose character rely heavily on visuals are the Four. We hesitated, but for Milla’s death scene we decided that it would be better if they talked. Kiga: Indeed. It’s only from there that they start to have lines. We also needed a way for Milla to express her feelings. Hasegawa: Milla’s return in front of Maxwell was a decisive moment. It would have been weird if Milla had been the one to suddenly tell him how the Four were feeling. Kiga: That’s my own interpretation, but I personally think that Jude and the others couldn’t hear them. I don’t think that Jude and the other party members ever had an actual conversation with them. Who was easy to write? Kiga: Teepo’s expressing natural reactions to situations. When there’s a scary scene, Teepo is scared. It’s simple. His actress, Haruna Ikezawa, built the atmosphere really well. We could truly see that once the scenes were done. Teepo expresses Elize’s feelings, right? Kiga: Yes. But the voice direction insisted that he was also his own character. Teepo exagerates things, which makes him say things that Elize is not thinking. So unfortunately, I don’t think he’s just expressing Elize’s feelings. For example, if Elize thinks “I’m thirsty,” Teepo would say “I wanna drink a beer!” He exagerates things like that. Hasegawa: Elize has a certain darkness characteristic of children. Kiga: Yes. Young children can sometimes say cruel things. Teepo is an extension of that. For example, on Milla’s side, there’s a scene where Milla shows them a glass ball that has special meaning to her. When he sees it, Teepo says “It’s just a boring glass ball.” Elize didn’t say it herself, but she thought it. That’s the role we gave Teepo. Kiga: Teepo also represents how people can say anything when they are anonymous on the internet. That’s why Elize had to let him go if she wanted to start using her own words. I was often asked if it was a good idea to make Elize put him away, but I personally think of him as a gimmick. Elize wouldn’t have been able to become an adult if she had kept him. Kiga: There’s a lot I want to do, and also I often tend to create characters who don’t say what they’re really thinking. It’s probably because I attach great importance to thinking something in your mind and then talking according to it. Hasegawa: It’s like you’re skipping a step. Kiga: I guess it’s hard to understand the context of a line from the script alone. I’m sorry. Did you explain to the voice actors what was to read between the lines? Kiga: I did. The more things are implied, the more crucial the acting is. When we finished the scenario, I thought it was imperative that the voice director understood me, so I often bothered Mr. Izawa. The actors had to do a lot of retakes until it was exactly like I imagined, so recording took time. Those who were really passionate about their job really enjoyed that, and later told me that it had been hard, but really fun, and that they thought it was well-done. Those words gave me courage. Please leave a message for the readers. Kiga: I think that there are parts that will betray long-time Tales fans’ expectations, for good or for bad. We aimed for something new, with more things being implied, different sides etc. We created this game hoping that the players will enjoy it. Personally, I would be encouraged if players analyzed the game after playing it twice and talked about their opinion on it, whether it be praise or criticism. Hasegawa: If for example your friend told you they would play Milla’s side, then I would encourage you to play Jude’s side and share your experience with your friend. I think it’s fun to compare others’ impressions with your own playing experience, so I think it would be nice if you didn’t just play the game and leave it at that, but shared your opinions with others. I hope you can use Xillia as a communication tool. 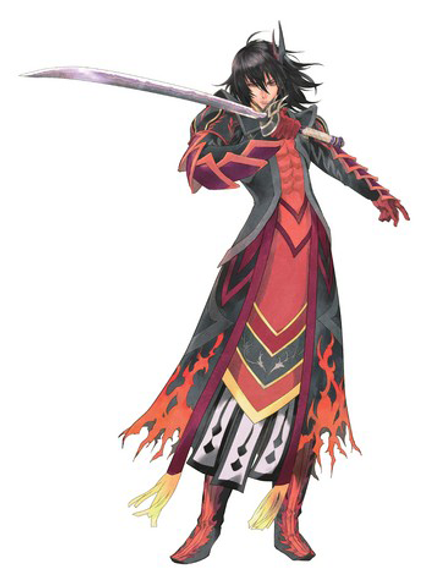 Inomata: Gaius was easy to picture.The only adjustments that had to be made were on details. Characters like him who’re frowning are actually pretty easy to draw, so his face was like that from the beginning. I reworked details a lot, however, especially his costume. At first his armor was really rough and huge. I knew the design would be rejected, and indeed it was (laugh). After that I learned that Gaius went out to town, so I fumbled about for an outfit that would not be embarrassing to wear in public. I drew him in armor as well as in normal clothes, but normal clothes wouldn’t have fit a boss character. Finding a good balance was hard. 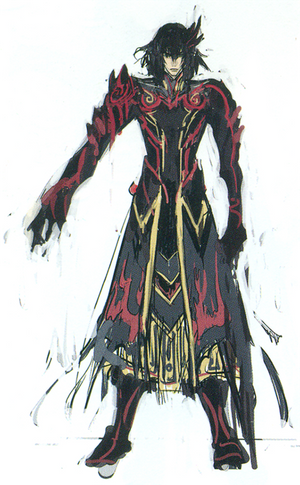 Fujishima: You drew him like an evil overlord at first, then you imagined him in normal clothes… He really went through a lot of changes, huh? Fujishima: It looks like a crown. Inomata: Only one piece remains in the second sketch. If I remember correctly, Mr. Baba asked me to keep it on one side (laugh). I think I was saying I’d remove the crown, and he told me that he should still have something on his head. So that’s probably how he kept a piece. Inomata: There’s a lot I didn’t understand about Jude, so I designed Gaius in opposition to Milla. Milla’s base is white, and she has an image of nature, like grass, wind, and water. 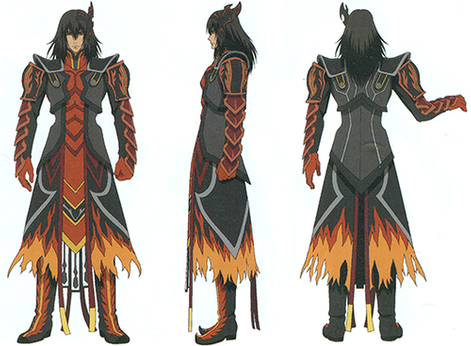 So I gave Gaius an image of darkness and flames. His costume’s base is black, and I wanted the middle to be red, looking like flames. I later dropped the ragged sleeves and hems idea, reduced their length, and made them different in front and behind. I was told that that huge and heavy-looking piece of armor on his shoulders and arms looked impractical, so I changed them. Inomata: It’s a lot neater than the previous one. The long threads have been removed. His face is the same though (laugh). Inomata: I drew that thing on his arms because I wanted him to have something hard, but now I wonder if it was really necessary. Fujishima: No, it’d be sad to remove them. Gaius fights on the frontlines; he needs to be able to guard from swords. Inomata: The colors are to make the patterns easy to see. I think I drew the hems like that to confirm whether they were okay. Since some parts are gone, I was probably asked to remove them. Inomata: I got Gaius’s face right on my first rough sketch. What was then left was to decide his costume. At first, he had a voluminous outfit, and his armor looked a bit like an exoskeleton. I knew it didn’t look right, though, and changed a lot of things. Inomata: This is a picture of my changes when I learned that he went out to town. I gave him normal clothes, but it wouldn’t have been fitting for a last boss, so I kept revising the design (laugh). I revised the costume thanks to Mr. Okumura’s advice. Inomata: At first he had a slightly different pose, and his sword was masking part of his face, but since it hid his face I had to lower it a little. That’s how he ended up with this pose. Inomata: I want to tell him to let his hair down a bit (laugh). He’s too strong-willed for his own good. Regarding his character, picturing him wasn’t hard at all. However, there were a lot of details to change. At first he looked like an evil overlord with an ostentatious armor, but then I was told “This would look really out of place in town…” and I was like “Oh, he goes out to town! ?” (laugh) It’s true that he would have looked ridiculous, so I made him dress like a normal person. But then he looked too “normal” (laugh). “I have to keep some parts of the first design,” I thought. His face stayed the same the entire time, though. 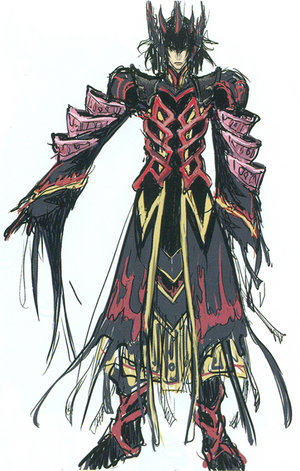 Fujishima: I wish I could see his “normal person” version. Inomata: He wore a black overcoat. Back to his original sketch, at first it looked like a flashy skull. His hems and sleeves were all wiggly. He would have looked ridiculous in town (laugh). I cleaned up that design. 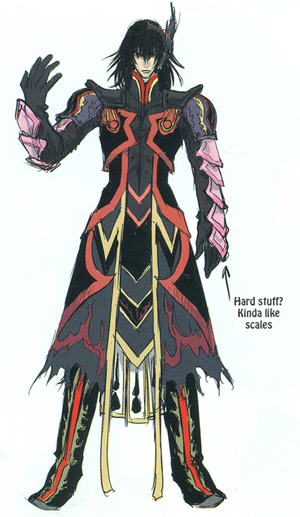 Fujishima: Gaius sounds like he was hard to draw. Inomata: At first I fooled around a bit. But when I tried to draw him taking settings into account I was told it was all wrong by BNG (laugh). 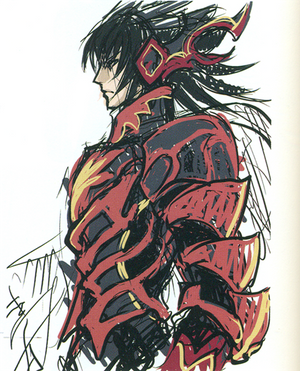 Fujishima: His design looks fine to draw once, but looks difficult to reproduce. The fire pattern looks especially troublesome to me (laugh). 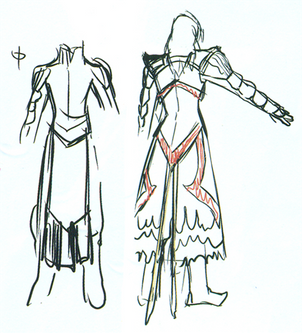 We know Gaius is a stubborn man with a strong will, but were there rough sketches where he was smiling? Inomata: I don’t think so. I never made him smile. Fujishima: I kind of want to see him smiling all over. Inomata: Maybe I should draw that. Gaius with a big grin (laugh).